The Born Wild Shooting Chair is designed for precision and comfortable hunting and target shooting. The Born Wild Shooting Chair is made in Northern California one at a time by talented craftsmen. It was designed for folks who shoot and hunt with rifles, both airgun, center fire, rim fire and even shotguns. It works well for the range, or out in the field. It will make any shooter improve on accuracy and comfort. Personally, I use the Born Wild Shooting Chair for varmint and pest hunting in my backyard at night with my .25 caliber air rifles. I also use the Born Wild Shooting Chair for banging steel gongs at a farm at 50, 100, and 200 yards away with my .458 and .58 Quackenbush Big Bore Air Rifles. Those things kick like a center fire powder burner, and I have developed a serious flinch. Using the shooting chair helps remove my flinch and I can sit comfortably, line up my shots and squeeze. Because the shooting chair swivels 360 degrees around, and up and down, it’s easy for me to target a gong to my right and quickly shift way to my left and at a farther distance. While I haven’t used it for serious hunting yet, it is on my bucket list to take it Turkey hunting this fall with the intention of taking head shots only. I think that the shooting chair or perhaps turkey hunting chair will steady my shots, and allow me smaller targets at greater distances. The tan color of the chair helps it blend in to the background. Turkeys have excellent eyesight, and so I will end up setting up a camouflaged blind, set up the hunting chair, and wait for the Turkey’s to come on by. Next on my list is ground squirrel hunting at a beef cow farm in the valley. The California ground squirrel is a serious pest for farmers, whether it be hay, vegetable crops, dairy, meat cow, horses etc. They dig deep burrows that will break a critter’s leg, and break equipment come harvest and plowing time. They can decimate a nut crop, or just bring disease onto a farm. The nasty ground squirrel carries fleas, and diseases such as bubonic plague. Farmers hate them. So I’ll drive to a farm I know of and set up my squirrel chair and blast squirrels all day. Can’t think of a better use for a Born Wild Ground Squirrel Hunting Chair. When I head to the range it’s to sight in my rifles, to blow off some steam and just have fun. I do hate the typical concrete benches and steel stools. My fanny ends up aching, and my neck gets out of whack since I can’t quite move things around to my liking. I often carry my Lead Sled to the range, weight it with 25lbs of steel, and strap my flinch inducing DAQ .58 Short Rifle or the DAQ .458 LA Outlaw. It is so uncomfortable to shoot though. It’s just one of the things I love about the Born Wild Shooting Chair. Plop your rifle in, strap it in or not, sit down, and adjust height, or angle to make yourself comfortable, and shoot away. It really is like night an day in terms of comfort. Plus, I shoot much better since I’m comfortable, I am stable, the rifle is stable, and fatigue sets in much, much later. 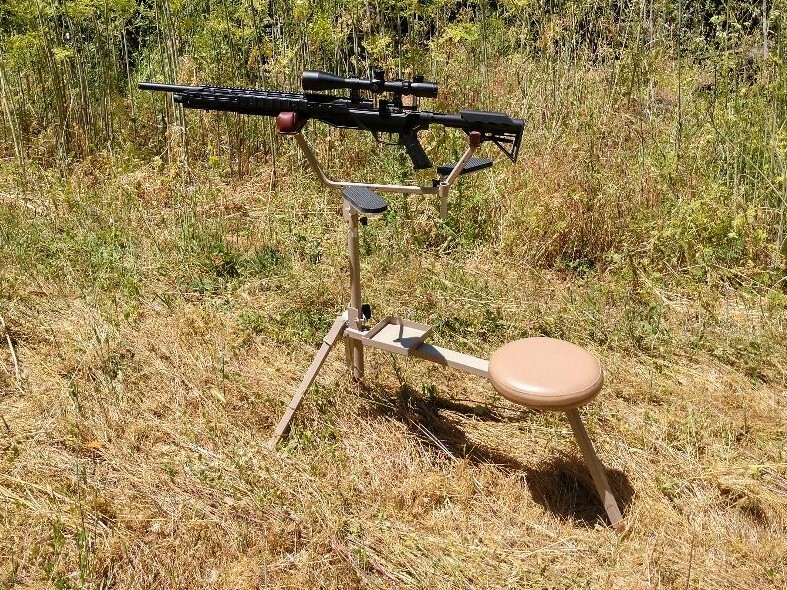 A shooting chair ain’t worth a squat if you can’t get it to where you want to do your shooting or hunting. The Born Wild Portable Shooting Chair shines in this feature. It is reasonably light, and you can pack it in your backpack, or in a duffle that Born Wild will be offering. It takes just a minute to assemble and disassemble, so you have more time to shoot. Make a shooting chair a portable shooting chair, and hunters and shooters will fall in love with it, and treat it as indispensable as any other hunting and shooting gear. Out on the rolling plains you’ll find massive numbers of Prairie Dogs, and a gaggle of Prairie Dog hunters, all taking a different approach to setting up and shooting these pests. Some folks use a shooting bench, others lay on the ground with the bugs and deal with itching. Others use fabricated hunting chairs. 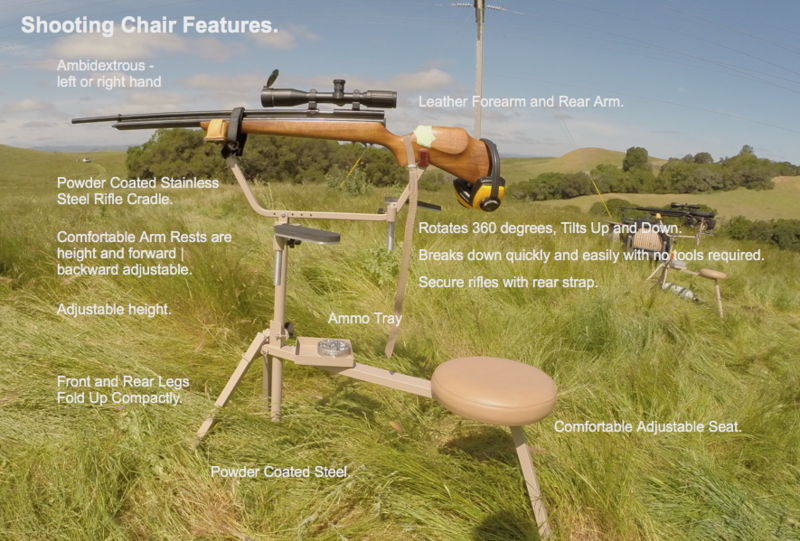 I think the Born Wild Shooting Chair is perhaps a perfect solution. It swivels up and down and side to side, and allows you to quickly target prairie dogs on a wide field. What features make the Born Wild Shooting Chair the best shooting chair for hunting, plinking, and target shooting?